Red wolves are the most endangered wolf species in the world. Two sub-species, Canis rufus floridianus and Canis rufus gregoryi are now thought to be extinct. Red wolves have several coat colors including black, brown, gray and yellow. The reddish coats for which they are named was typical of some Texan populations. As medium-sized canids, red wolves are smaller and more slender than their gray wolf cousins, but larger than coyotes. Adult males weigh 60 to 80 pounds. Females are smaller and weigh 40 to 60 pounds. 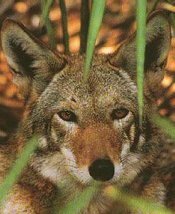 Most red wolves in the wild reside in the Alligator River National Wildlife Refuge in North Carolina and at the Great Smoky Mountains National Park in Tennessee. Once hunted to the brink of extinction, in 1980 fewer than 20 wolves were rounded up by the U.S. Fish and Wildlife Service to be bred in captivity. The wolves were officially declared extinct in the wild. By 1987, enough animals had been bred to begin a reintroduction program. Thanks to these programs, there are currently 70 to 80 red wolves in the wild. The red wolf was once found throughout the southeastern United States, from the Atlantic coast to central Texas and from the Gulf Coast to central Missouri and southern Illinois. Between the period of 19OO to 192O, red wolves were extirpated from most of the eastern portion of their range. A small number persisted in the wild in southeastern Texas and southwestern Louisiana until the late 197Os. By 198O, the species was determined to be extinct in the wild. The present red wolf population of at least 249 to 280 animals exists primarily in captivity. About two hundred (2OO) animals are located in 22 captive breeding facilities in the United States. The U.S. Fish and Wildlife Service has a major captive breeding project at Graham, Washington. This project is administered by contract with the Point Defiance Zoo in Tacoma, Washington. 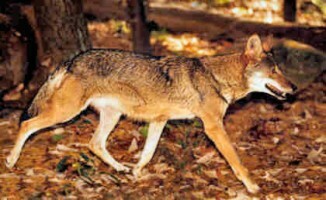 To date, there are 30 to 50 adult and yearling red wolves in the wild at the Fish and Wildlife Service’s Alligator River National Wildlife Refuge in North Carolina; there are 16 animals in the wild at the Great Smoky Mountains National Park in Tennessee and seven animals in the wild on three islands managed as propagation projects. It is estimated that red wolves live four years in the wild and up to 14 years in captivity. Historically, the Canis rufus species ranged throughout the southeastern United States from Pennsylvania to Florida and as far west as Texas. Telemetry studies indicate that red wolf home range requirements vary from about 25 to 5O square miles. Red wolves prefer to live in forests, swamps and coastal prairies. Dens are often located in hollow trees, stream banks and sand knolls. The last red wolves were found in coastal prairie and marsh habitat because this was the last area in which the animals were allowed to remain. Any habitat area in the southeastern United States of sufficient size, which provides adequate food, water, and the basic cover requirement of heavy vegetation, should be suitable habitat for the red wolf. The red wolf’s diet consists primarily of small mammals such as rabbits and rodents but also includes insects, berries and occasionally deer. Shy and secretive, red wolves hunt alone or in small family packs. The red wolf is primarily nocturnal (active at night). Red wolf pups disperse at about 6 months of age. It is thought that red wolves mate for life. Breeding occurs in February and March, and pups are born in April and May. The average litter size is about 4.6 young. Our experiences, to date, indicate that without veterinary care, pup mortality in the wild may be significant. Red wolves have been known to establish dens in hollow tree trunks, stream banks, abandoned dens of other animals, drain pipes, and culverts. They have been known to excavate dens in sand knolls in coastal areas. Dens found excavated in the coastal plain region of Texas and Louisiana averaged about 8 feet in length and had an entrance diameter of about 2 to 2.5 feet. Two dens have been documented during reintroductions. One was beneath a rock outcrop, and the other was under hay bales in a barn. Evidence suggests that the pups spend more time in beds located in areas of good cover than in the den, especially after they are 6 weeks of age. Both males and females take part in rearing the young. Frequently, young of the previous year have been found in the vicinity of dens, but they do not appear to participate in the guarding, feeding, or training of the pups. Red wolves apparently exist as small family units (packs) of an adult pair and their young. The offspring disperse at about 6 months of age. 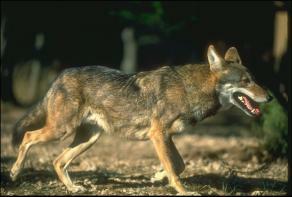 Threats to the red wolf include habitat loss because of human development and illegal hunting. *Convention on International Trade in Endangered Species of Wild Fauna and Flora, an international treaty with more than 144 member countries. Appendix I listed species cannot be traded commercially. Appendix II listed species can be traded commercially only if it does not harm their survival.